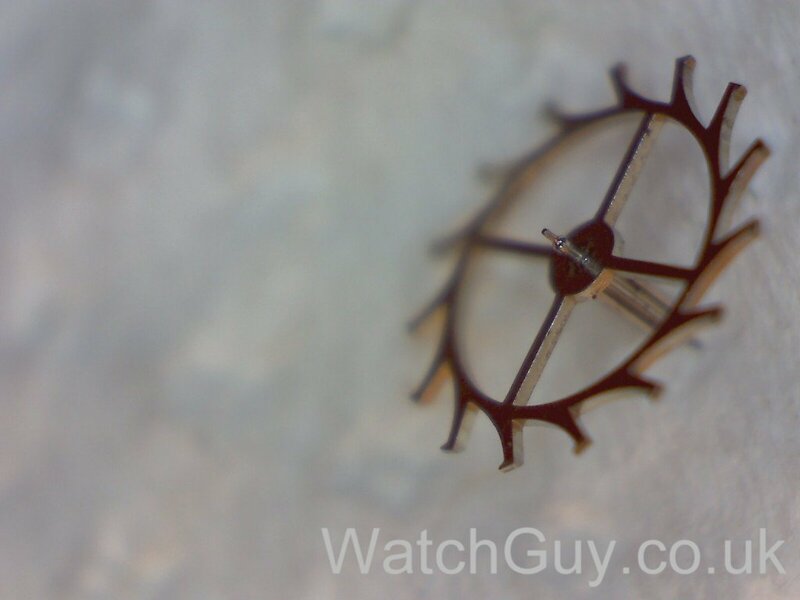 I got this Rolex Oysterdate off eBay – very much “pre-loved”, with a chip in the glass and some scratches. But considering that the watch is probably a good 30 – 40 years old, this is not bad. But the watch needs a good clean – the hands have a fair amount of patina, there is dirt on the dial, and the glass and gaskets need replacing. The Oysterdate Precision 6694 is one of the Rolex watches that is not chronometer certified. 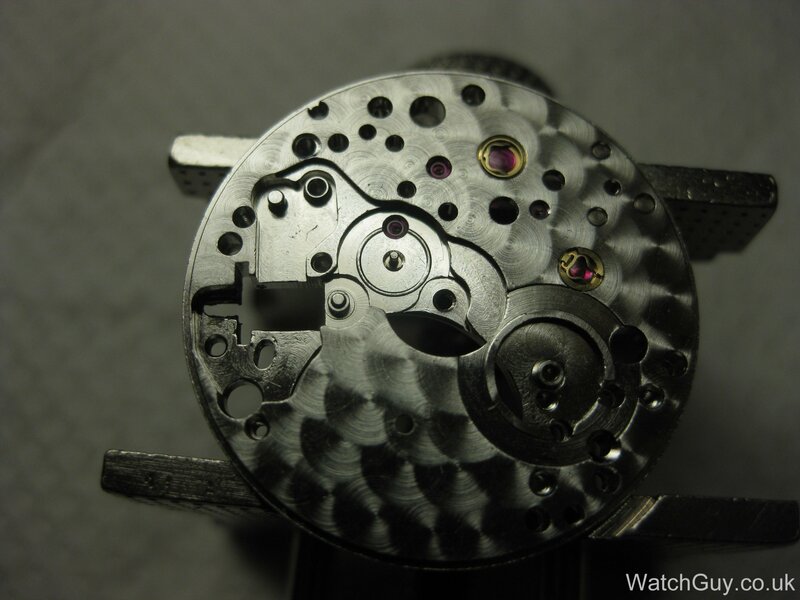 It has the calibre 1225 movement, which beats at 21,600 bph / 6 bps. I’ve worn it for a couple of days, and it was a good 15 seconds a day slow, but fairly steadily – what you would expect from a Rolex. 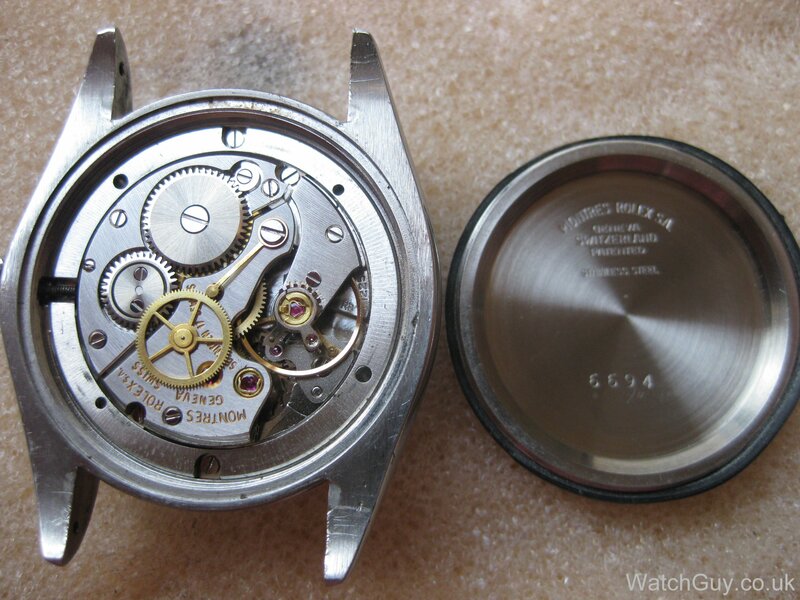 The watch diameter without crown is 34mm, with crown 38mm, so for today’s standards, on the small side. But I have a very small wrist, and I don’t like huge watches. It’s nicely understated, and only few people will recognize you are wearing a Rolex. Nothing flash or blingy, just a nice watch! The bracelet is original and comes off easily – you can push the pins from the outside. If you click on the image to enlarge it, you will see the state of the hands – lots of patina! First things first – hands off! 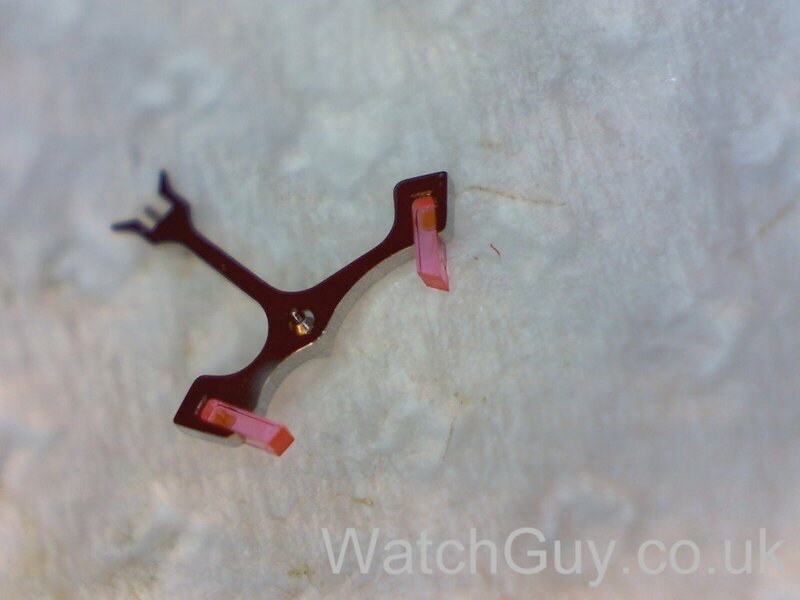 As this watch needs a new glass, I remove the bezel. Now it’s time to order a new glass and gaskets, and to clean all the parts. The next step from here is to polish the case as it has quite deep scratches and dents. very informative, thank you a lot. 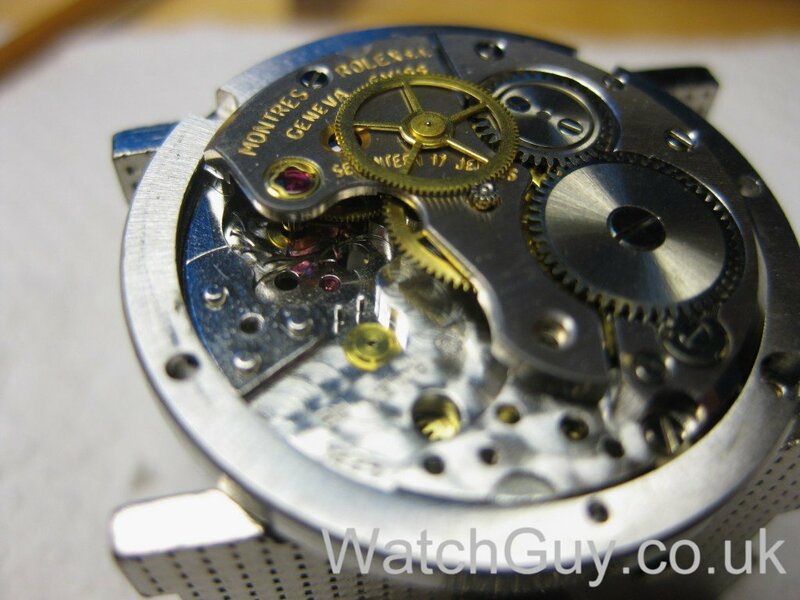 i don’t see any serial number on this movement. i wonder when they started to affix a s-number. 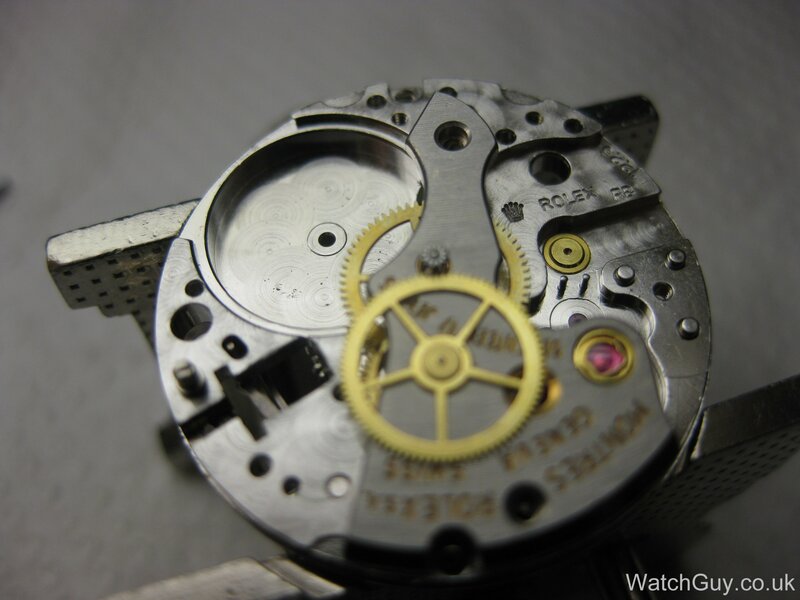 does “RB”, engraved near the cal.-number, mean that the movement was developed and produced at Rolex Bienne ? I just purchased a 6694 from 1973, my birth year. 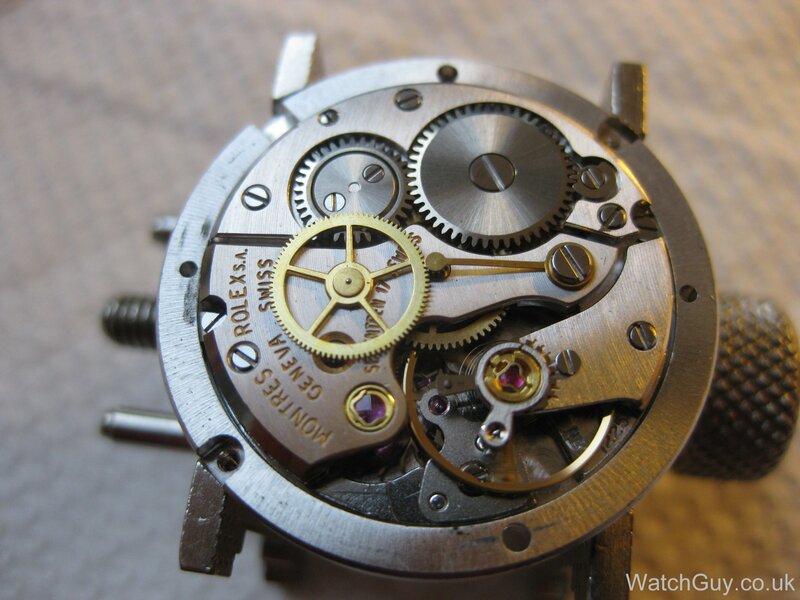 I am going to get the movement overhauled. What are some of the most common parts to be replaced for this caliber movement in your experience? 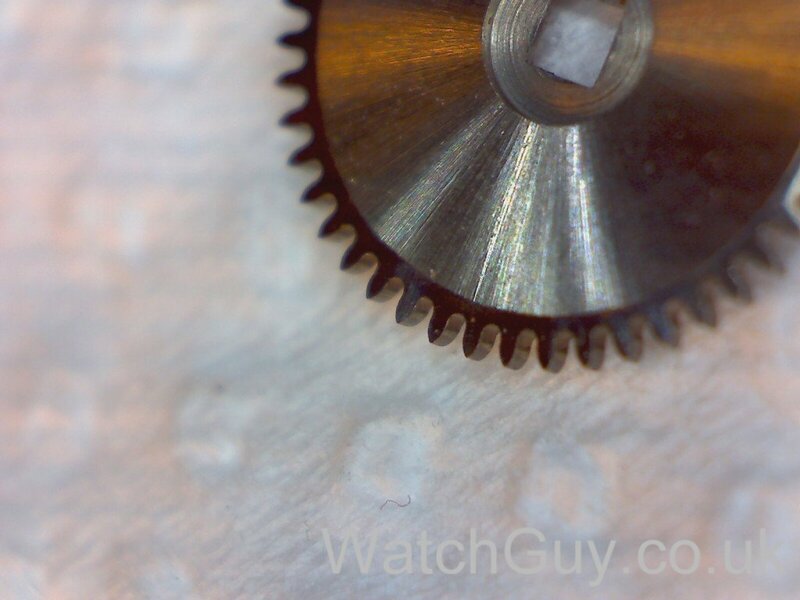 Anything I should have my watchmaker examine more closely for this caliber. I will have the mainspring and gaskets and crystal changed automatically. I was just curious if there’s anything else to be on the lookout for. Thanks for your time. Great information here. I am a new owner of a late 60’s stainless 6694. I am looking to have the bracelet and case polished . Can you tell me what the factory original finish was? ie polished or satin finish on case or bezel or a combination . Don’t get your bracelet and case polished. You will have material taken off that you can’t put back on. True collectors of vintage watches never do that. Thank you for the reply. I appreciate the advice and I will take it! First off, I would like to say that it is truly a amazing and detailed information that you shared there mate, well done and thanks for sharing! 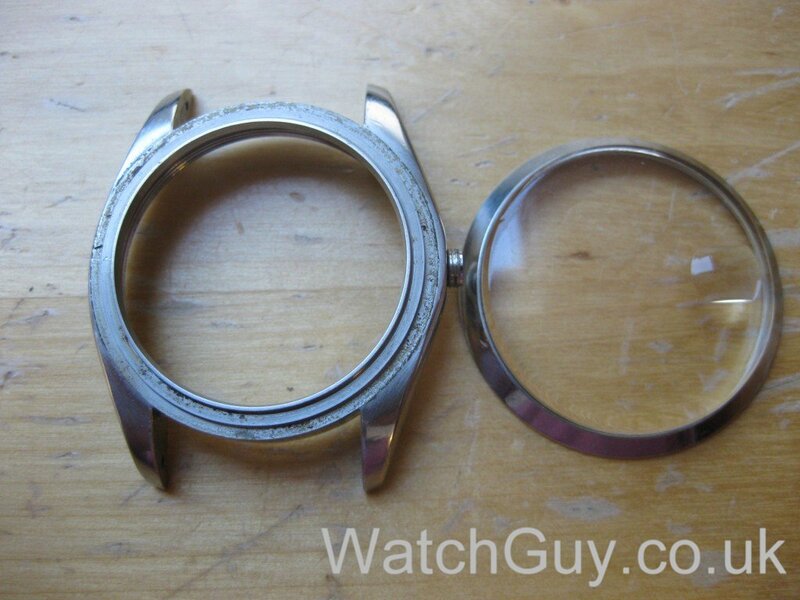 Secondly, I am wondering if the bezel size of this 6694 is 34mm? As I am thinking of replacing my stock bezel with a fluted one and I happened to come across one but stated that t’was from a Rolex 1500, and I am wondering if that will eventually fit my 6694. Thanks for your time in advance and hope to hear from you soon! I’m afraid I don’t know the bezel size for your watch. Thank you very much for your rapid response regarding my enquiry. However, did you manage to measure your 6694 bezel upon removal? I suppose if it’s 34mm then every 34mm bezel size would be able to fit? Only one piece of advise. 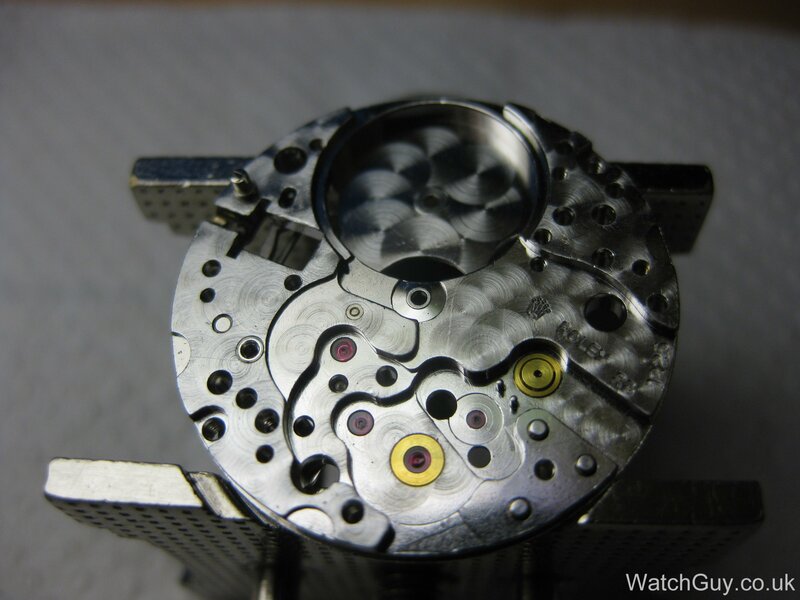 Please don’t do that yourself, but let a watchmaker do it. sorry for reviving an old post. I was gifted with a vintage 6694 in a similar, slightly better condition that the one above. Your blog provided the most accurate information about this humble beauty. i’d like to ask about the bezel. Mine did not have any rolex markings or labels on the back side and was suspected by the RSC and my trusted jeweller to be aftermarket. But i’ve noticed the one in the post does not have any markings on the bezel back as well. do you think they came without any branding on the bezel. thank you very much again and much appreciated! I don’t think this model had Rolex bezel markings – that comes in on later models. how in the world would you remove a link from the bracelet, just cannot figure it out for the life of me. you’d be a life saver, there’s no way they are not removable is it? This is the worst bracelet construction ever… You have to bend open a middle bit to remove a link, and it’s as good as impossible to bend it back so that you won’t be able to see deformation. Please don’t atempt that – it will end in tears. Go to a watchmaker and have it done. any idea what they would charge me? as it doesnt need the full service, im almost at the 3 year mark – still around $400 u think? 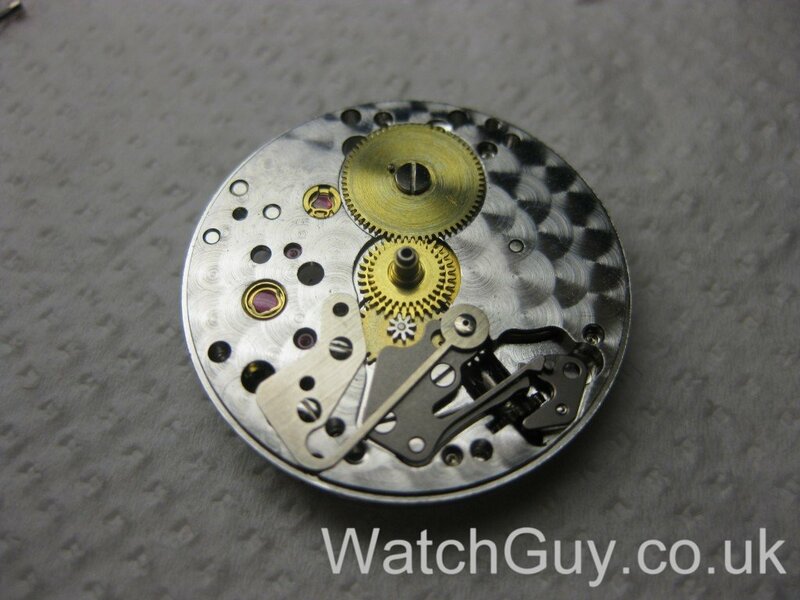 I suggested a watchmaker, not a Rolex service centre. £30 or so?? i paid close attention to that actually lol thats kinda why i was clarifying. that sounds much more like it. wasnt sure if they would do that. ill give it a try, jewlers willing to do that without servicing it seems to be scarce near me. ill look around. thaks so so much for your time and help! great writeup! If I hold the watch up to my ear, I can here ticking. I’d this correct for this model 6694, 1971 year. The bracelet is so very light. Looks good, but so light. Is this correct for this watch? Why would the watch not tick? The original bracelet is pretty flimsy. Yes, that’s an original feature. Nice post! Could you please say how long a full winding lasts and how many turns it takes to fully charge the watch feom idle? Thank you for the share , very instructive !!! Can you please tell me what size screwdriver you used for the winding shaft ? From memory, I think it’s the yellow screwdriver. Whatever fits the setting lever screw without touching the bridge is right. 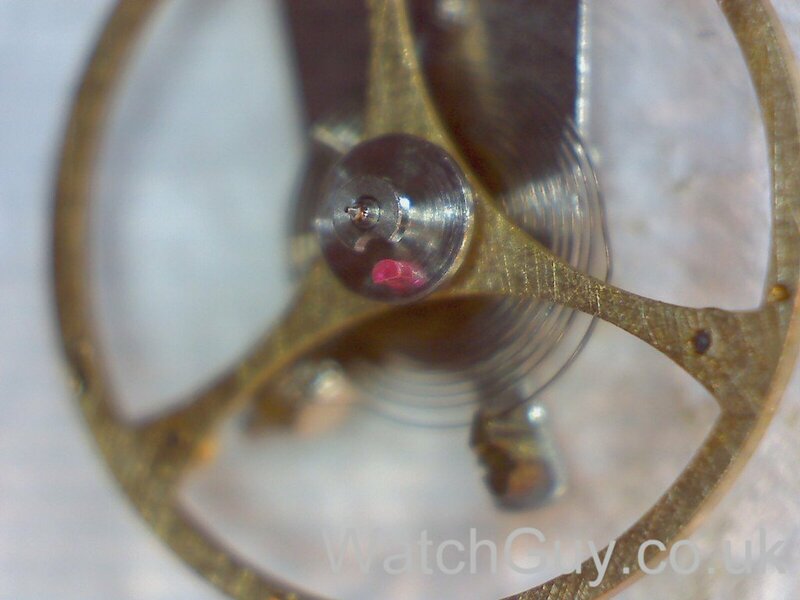 What size is the back removable tool for a rolex oyster date 6694. Where can I get balance wheel assembly for Rolex oysterdate precision. On eBay, for a lot of money, if you are lucky. They face has the exact words as your, but the number indicaters seem to be tapered and the 6 & 9 seem slightly longer than the rest. I believe it is from 1955 it is a oyseterdate, precision. 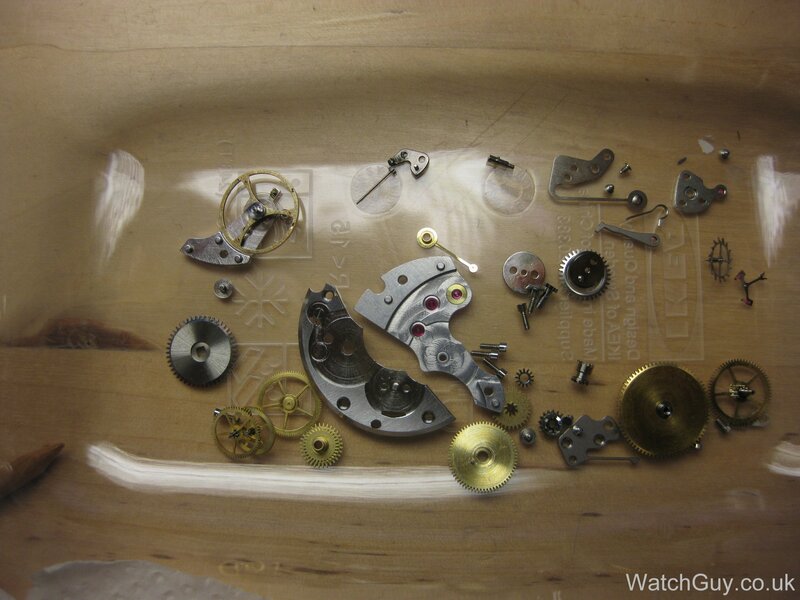 It needs new, hands,glass,dial,pin. Where would one find parts for this? If it’s a 1968 6694, it’s probably not fake??? Get a repair slot on Saturday, and we will have a look. If it’s a fake, we will return it to you. out of interest, how do you remove the ring around the crystal? i’ve seen people using a razor blade to remove it, but that just doesn’t seem right. 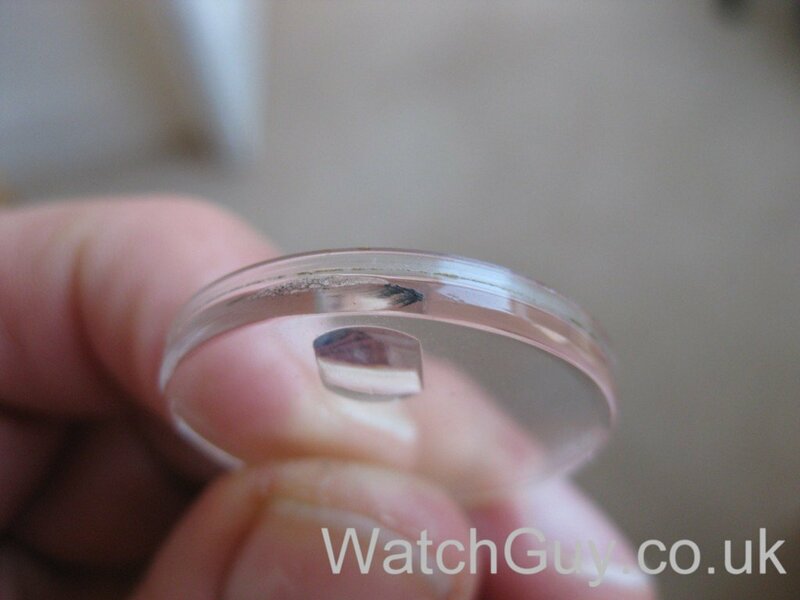 The other thing i’ve seen on ebay is that it is possible to buy sapphire glass crystals instead of the acrylic crystals. Do you think that is a good idea? My father’s 6694 watch dates back to 1968, so the edge of the crystal is now completely rounded off. There is a special tool with four sharp blades that we use. i have a 1966 6694 cali. 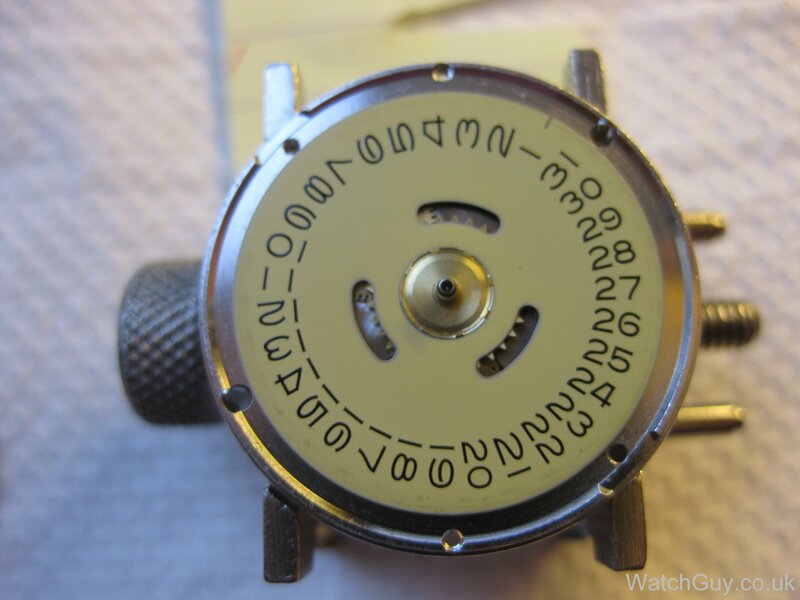 1225 and i wanted to upgrade my dial, can i buy any dial and it will fit, or do i have to buy a certain dial? The dial has to be right for your movement and your case. Rolex are charging about £500 for hands and dial. Their London office can still service this movement and it is a minimum of £430. 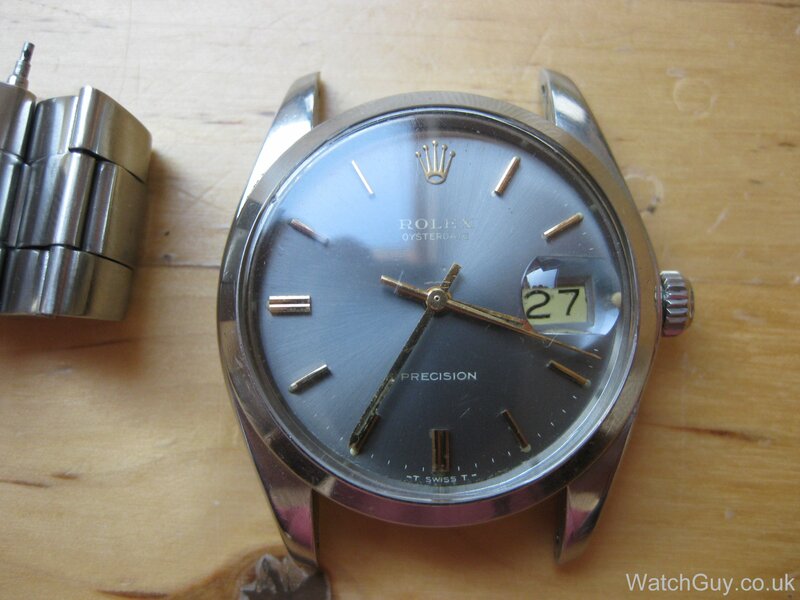 For a 1979 manual wind, hollow Stainless steel bracelet, ROLEX 6694 OYSTERDATE PRECISION DATE, where can I get an original new replacement steel bracelet. I would prefer a solid stainless steel oyster bracelet. I doubt that even Rolex can supply you with one. Dear Christian,will you please kind enough to explain if there is any difference along escape wheel and pallet between the two Calibres 1215 and 1225. I’m afraid I don’t know – the escape wheel and pallet fork might well be identical. The balance and it’s suspension are definitely different. hi i have a rolex 6694 oyster date but i don’t know if it is real or fake. can you give to me any suggestions about it? can i find it out by serial number? 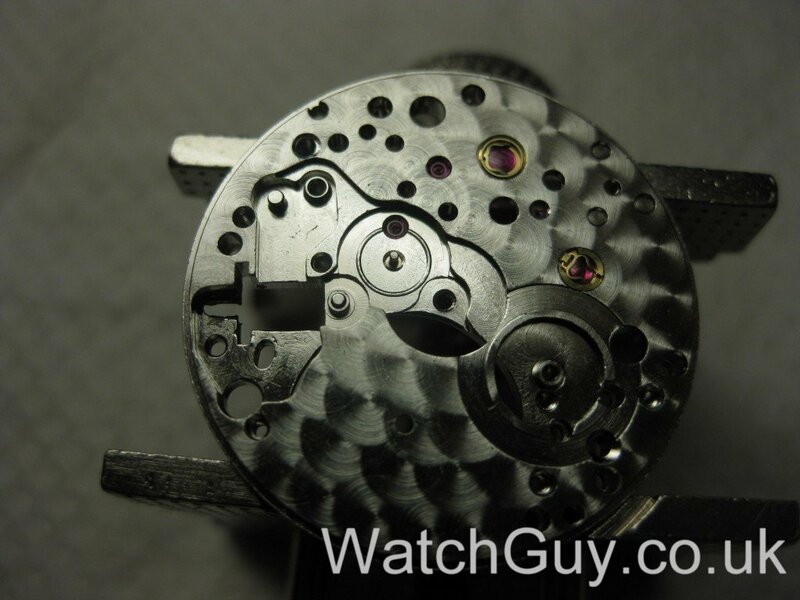 Have a watchmaker look inside. It takes 1 second to tell. I very much doubt that. A strap is a strap (at least in my book), so why don’t you rather look for something that looks good, rather than being original? Thanks Christian for the reply. Will be looking for aftermarket options then. I do have another question. What is the maximum lasting time after a full wind for a 6694? I’ve heard it ranges, generally 36 hrs is the passing standard, and some can go up to over 40 hrs. But what is the actual specification? There must be a spec sheet in the old days. Ranfft says that the 1225 has a 58 hour power reserve. Thank you Christian for the info. Nice to know that it has a 58 power reserve. If you buy a Rolex strap, it is several hundred pounds – even on ebay. You can find Rolex buckles there and can be fitted to a good strap. It is probably 19mm at the watch end and 16mm at the buckle end but you would need to check. Hello Christian, if a customer presented the watch in this article how much would this level of service likely cost? A full service for a 1225 is £110 as per our price list. If additional work needs to be carried out, we will quote for that and check with you before carrying it out. 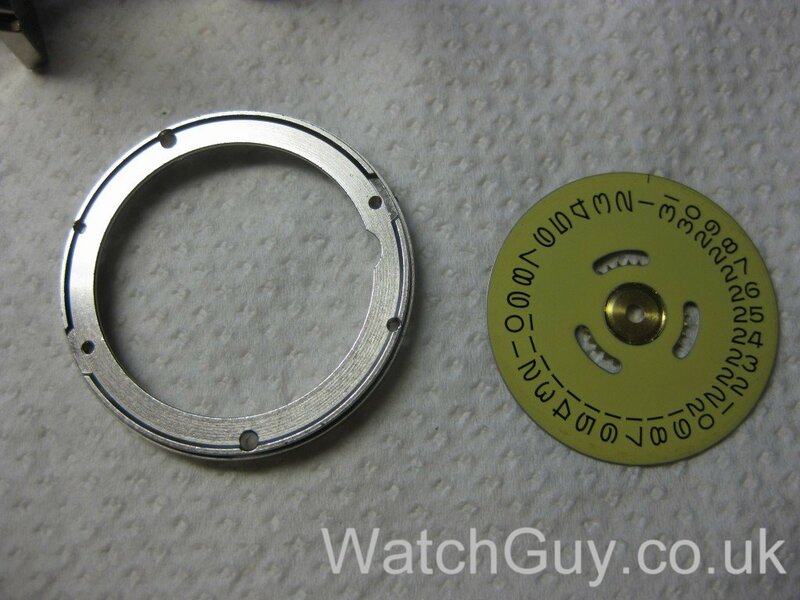 Rolex currently charge a minimum of £430 subject to no parts needing to be replaced that are not covered by their guarantee and their London office can service this movement. The glass on these is a plastic acrylic one and is changed as part of the service. Hello Christian, if a customer presented the 6694 you purchased off eBay, and wanted the same level of service detailed in this article, how much would you charge? I ask because I intend to purchase a vintage 6694 I want to factor in a realistic cost. Great article on the 1225. I would like to know if a special puller is used to remove the top wheel that transfers motion from one of the train wheels to the center seconds hand, they seem to be a co-axial assembly. I have this same watch ref. and caliber, but do not want to proceed without knowing. I have successfully serviced many standard movements with the seconds at the 6’oclock position, but never this type. Any help would be great! There is indeed a special tool for that. Cousins sells it for around £50. Ah, upon a bit further research, this is an indirect seconds movement and It’s the sweep wheel which is driven off the 3rd. I need a Presto No. 3.! That should do it, if you have a better method or suggestion, please let me know. Yes, the presto tool is right. Sometimes, it’s easier to remove the bridge with the wheel on, and use the tool from the other side once the bridge is removed. The Presto tool will be on it’s way soon. 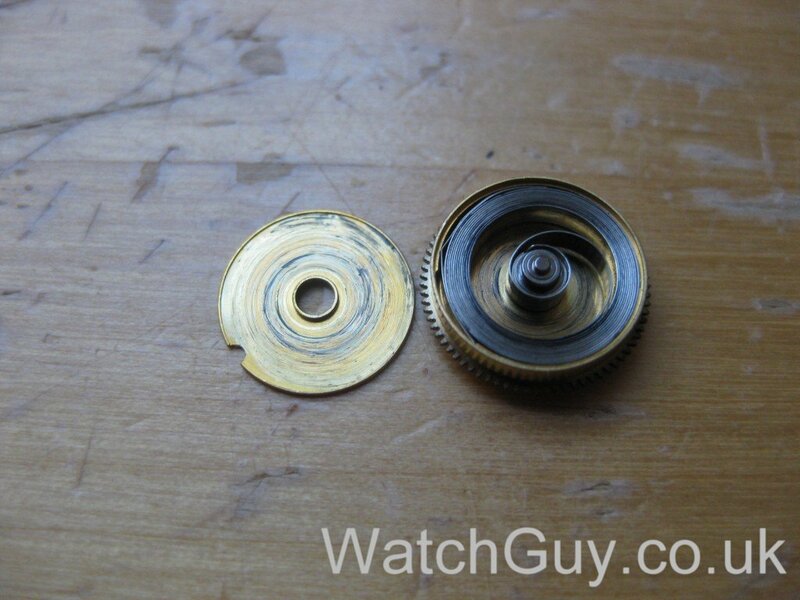 Will a standard cannon pinion remover remove the cannon pinion on this movement? It looks dangerously close to the center wheel in your photo of the wheel bridge removed, and looks as though removing it would bend the spokes on the wheel. A standard canon pinion remover does the trick, no problem. Most excellent thing to know, especially when working on a Rolex. Again, thank-you Christian. I have this same watch. Same color and all. I actually just picked it up from home today. My father who passed away over 20 years ago received it as a gift from Saudi royalty (which there are boatloads of) in the 80s when we lived in Saudi Arabia. Today I decided someone should wear this thing that’s been in storage for about 30 yrs. it had about 1-2yrs of wear a few years ago by my younger brother and that’s literally it (still enough time to nick it up a bit). Happy to see the breakdown of what’s inside this machine! I live in New York. What is best way to take care of this. One issue is that I don’t have original straps and don’t want to waste too much money. I took it to one showroom and they said that if the straps have been changed, Rolex will make me buy new ones or else refuse to service it!! Don’t take it to Rolex. 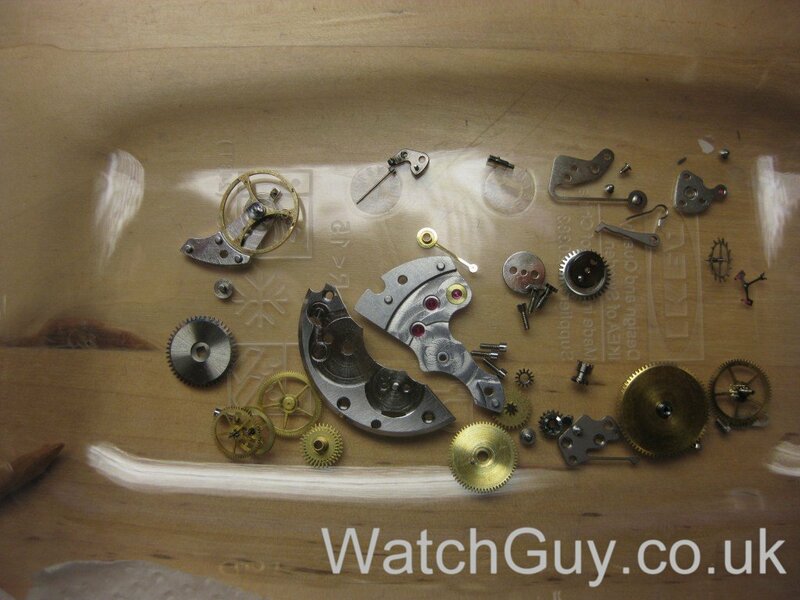 I have a 6694 from 1971 and just got it serviced & cleaned, and the crystal replaced, by Star Watch Service in NYC. 30th street by Madison. Mr Kim will take good care of you. 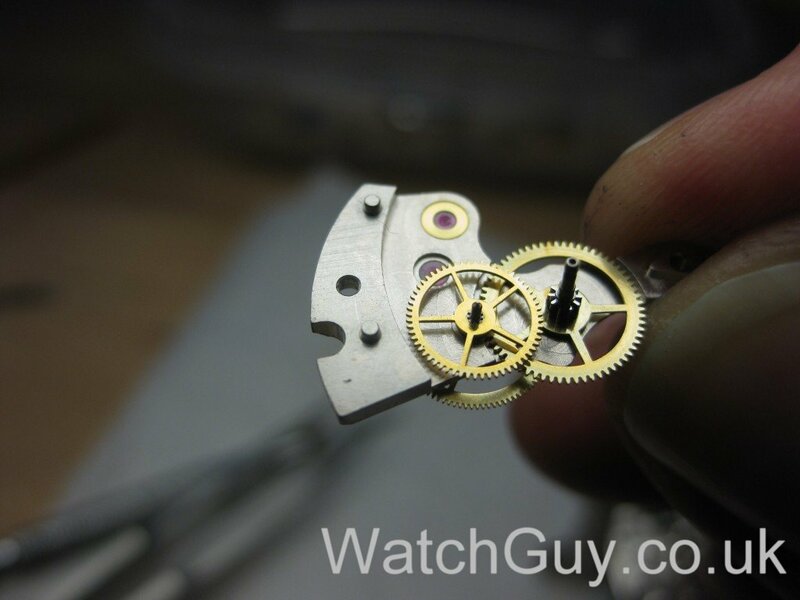 I just reviewed his work on Yelp, take a look under “Star Watch Service” in NYC. don’t take it to Rolex. It’s a hassle and you’ll pay so much more. I took mine in to London and they were most helpful. The strap it came with was old, they removed it for me. They told me the prices of their straps and gave me the measurements and said if I bought a strap, they would fit it. They also took the buckle off to polish it. They will replace the spring bars, and refit a new strap of my choice. I have always found their work excellent. Not cheap, but definitely the best. would you plz tell me how exactly can I uninstall the center wheel? You really really shouldn’t take apart Rolex watches. Please practise on something cheap and cheerful first. You have to pull up the cannon pinion from the other side to remove the centre wheel. But please don’t do that yourself. Superb article! I know it’s an old article however I was after some advice? My early 80’s crown sits quite proud of the case but it doesn’t effect the operation of the watch. It does detract from the look though in my opinion of course. Can this be resolved and if so what is the cost and length of time you would need it for? 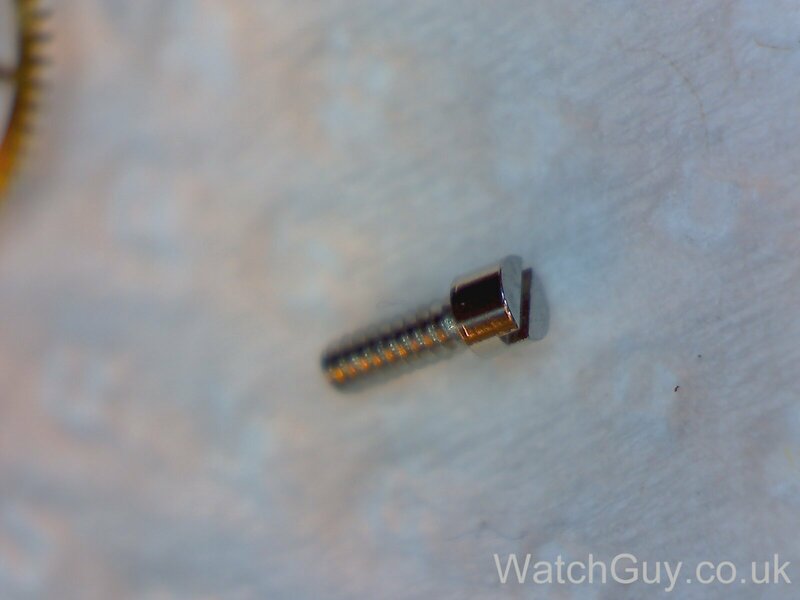 Hmmm… It could be that the winding stem is too long, or that you have dirt in the pendant tube thread. Either way, no big deal. If that’s all the watch needs, we are in the low 10s to resolve the issue. The usual process of getting a repair slot applies, and all other questions should be covered on my faq page. I have become a 6694 owner recently too. Just wanted to replace the sad looking hands and on the market Rolex hands are sold with references to Calibers, only sometimes Sellers disclose their sizes. 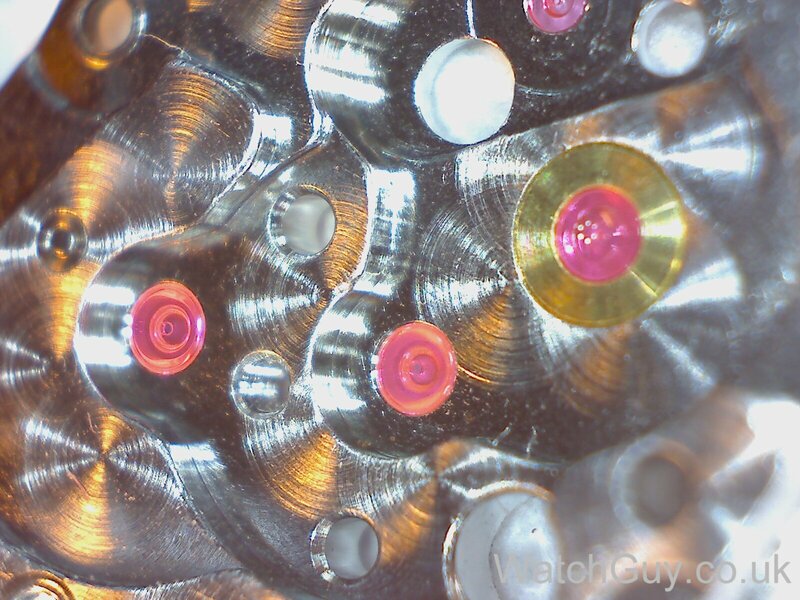 For example: 80/120/20 (holes sizes in mm for H/M/S hands respectively) for Calibers 1530… to 1575. This confuses me a little bit: How can the Minute Hand (1.2mm I believe) having a hole wider than the Hour Hand (0.8mm) according to the above? If you can shed some lights on that, would be good? And finally, would you let me have the sizes of Watch Hands for the Rolex 6694, and if you know where best I can get a set? I’m sure the hand sizes were just given in the wrong order. I don’t have the hand sizes for that movement. Use a micrometer to measure. I recently bought one of these second hand in Hong Kong. This was the most amazing and helpful resource I found when researching it. So I just wanted to say thank you. Your photos were particularly valuable in helping to verify its authenticity when I examined it and the dealer opened it for me. So thanks again, and I may need to get you to look at when the time comes for servicing. As a practical question, there’s a mark inside the case back that claims it was serviced in 2012. Assuming this is accurate (it’s running well, consistently -1s/day in position 1) how soon would you recommend servicing it again? You can leave a good 5 years between services. I have the same watch (apart from having a silver face and hands) and it probably dates from the early to mid 1980’s. Is the date only changed by winding the time on or is there another way?. The winder only has 2 positions when released from the screw down. 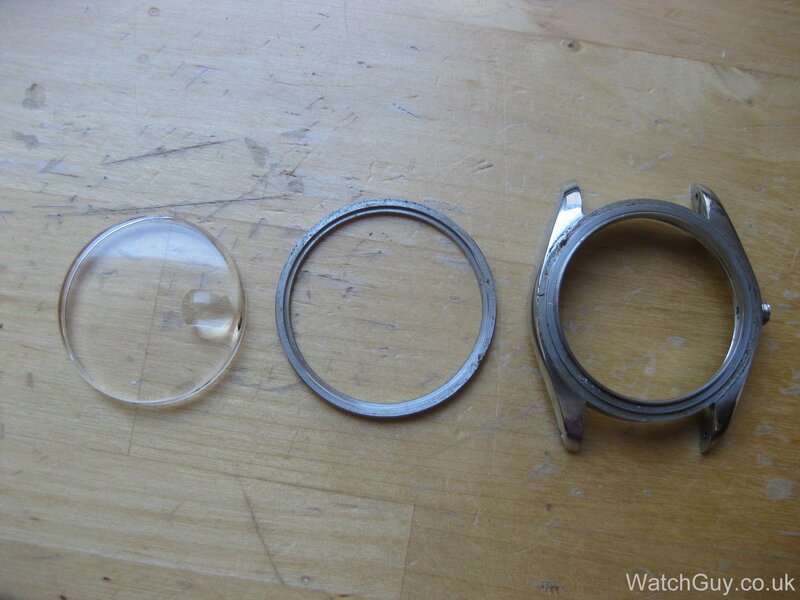 I have a 1986 Precision Datejust, 1 previous owner, what would it cost to have this watch serviced & cleaned, & to have the glass cover replaced? A service is £150 + parts, and the new crystal should be around £10 or so. Please go to http://watchguy.co.uk/cgi-bin/book.pl to book a service slot. I have the exact same watch. my dad gave it to me as heritage. I love it. 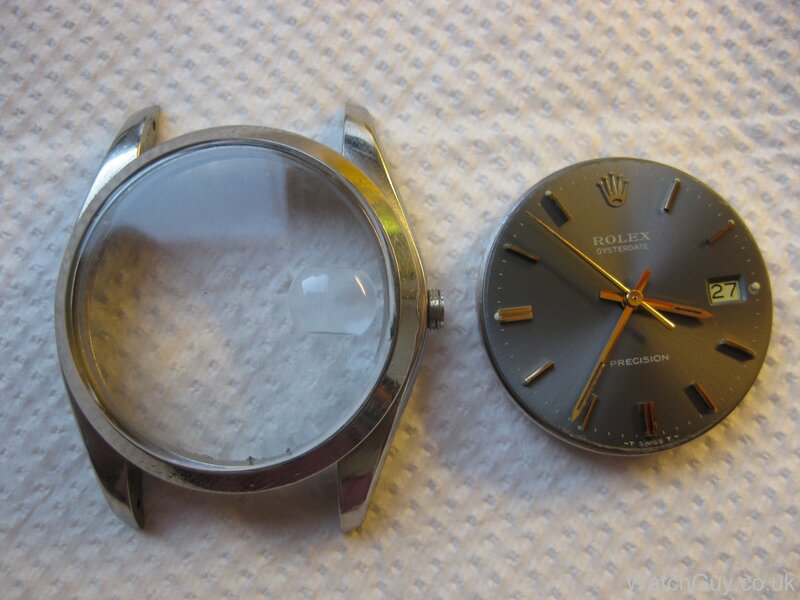 Do you think if i send it to Rolex they will give me a full restoration. i want this watch to live another 50 years. What width is the bracelet for an oysterdate? I’m afraid I don’t know, and I can’t measure it as I have sold the watch in the meantime. Could one remove patina on the dial markers/indices with cape cod? 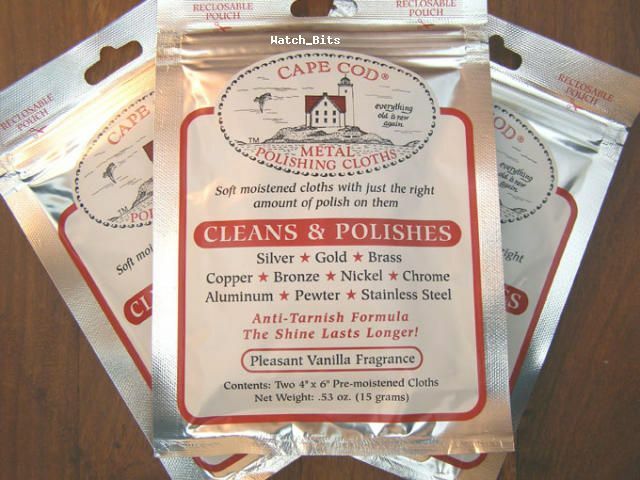 Now I’ve been to Cape Cod, but never cleaned with it – please enlighten me! Trying to clean dials normally ends in tears. The only thing I do is to brush them with a soft brush that is absolutely clean. 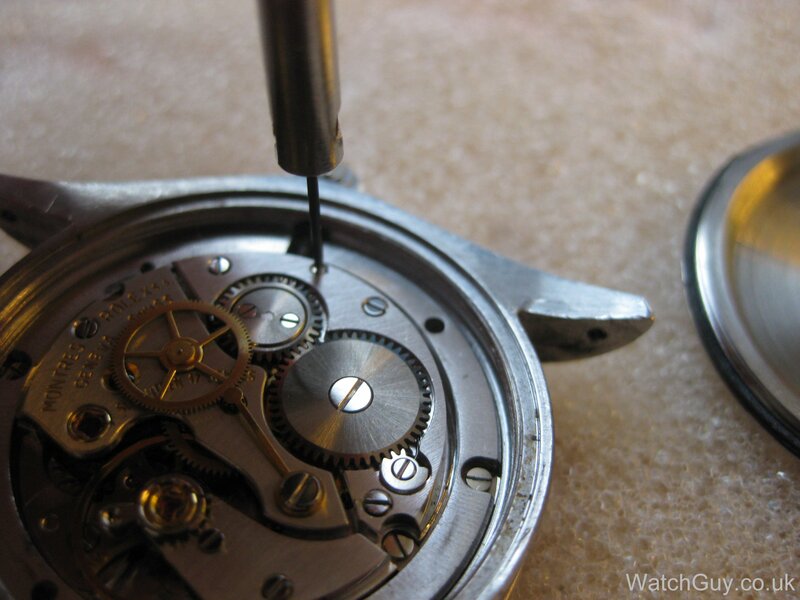 Any attempt to clean a dial will result in damage. Perhaps you have a better method? Very nice read, not to mention the watch. I just had my Dad’s 1960 Oysterdate Precision resurrected. I was wondering if you have any idea where I could get an original steel bracelet? I want to give the watch a total lease in life with probably another 50 years or so. Thanks! 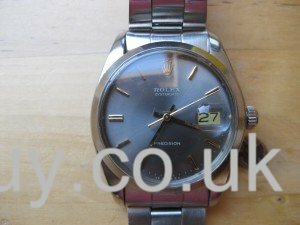 I have a Rolex 6084 super oyster case which i’m doing some restoration to, i wondered if you could advise on the best way to remove the bezel as it seems to refuse to pop off. The plexi is out but there appears to be some gunk in the space between the bezel and the case lip where the plexi sits. I’ve tried my fingernails, a sharp knife, case back opener… nothing seems to work. Any ideas would be appreciated. I also have a 6084 but I came to the conclusion that the bezel was not removable. Do you have any updates, is it removable and if so how did you do it. I’m afraid I don’t quite understand the question – could you try to re-word that, please? Hi Christian, just wonder if you know where i can find MOP with diamond dial for this 6694. I google but seem like no one make them. I’m afraid I don’t have a clue! 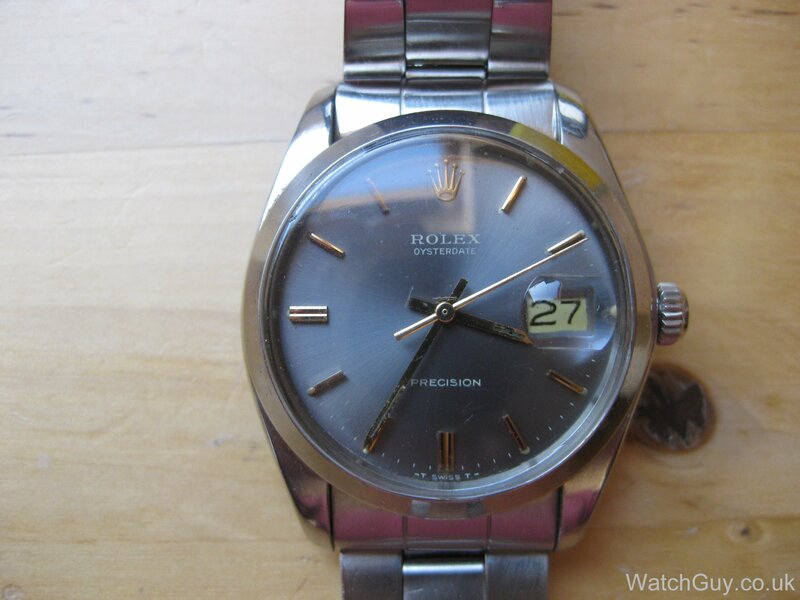 hi, was browsing through the net and i found a left handed rolex 6694. Is it possible that rolex created one for lefties? Yes, there are versions for left handed people, and they are pretty rare – probably less than a thousand were made. Not sure if that will fetch a higher price, as few people will want one. I am left handed, but I wear my watches on the left as everyone else. What a super posting! Congrats! I just bought an Oysterdate Precicion yesterday and – surfing for more info – found this blog… I’m delighted! Do you know anyone that can sort the thread on the case where the tube fits, it is stripped no thread ? You could try http://www.replateit.com/ Or, rather than re-threading with a larger diameter, and then having to make a new pendant tube that fits, which will be a very costly operation indeed, I would try to use a two component epoxy glue to fit a new pendant tube into the case with the damaged thread. hi mate i need one link (screw not pin) for this model the oysterdate precision. Sorry, I don’t deal in parts. Great review. You are a real craftsman. How does one remove the steel bezel on this model? Mine is very damaged and needs to be replaced. Thanks! 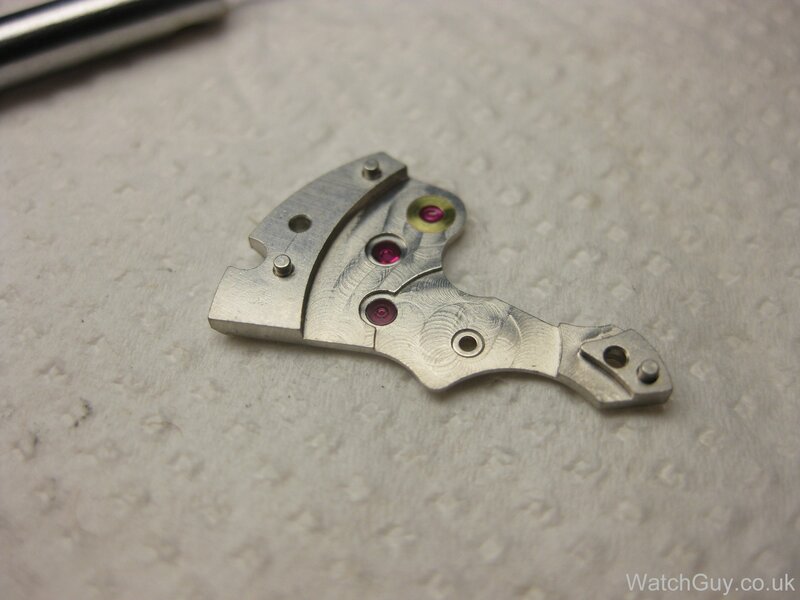 With a bit of luck, you can get it off with a simple case opener, working your way very carefully around the bezel. 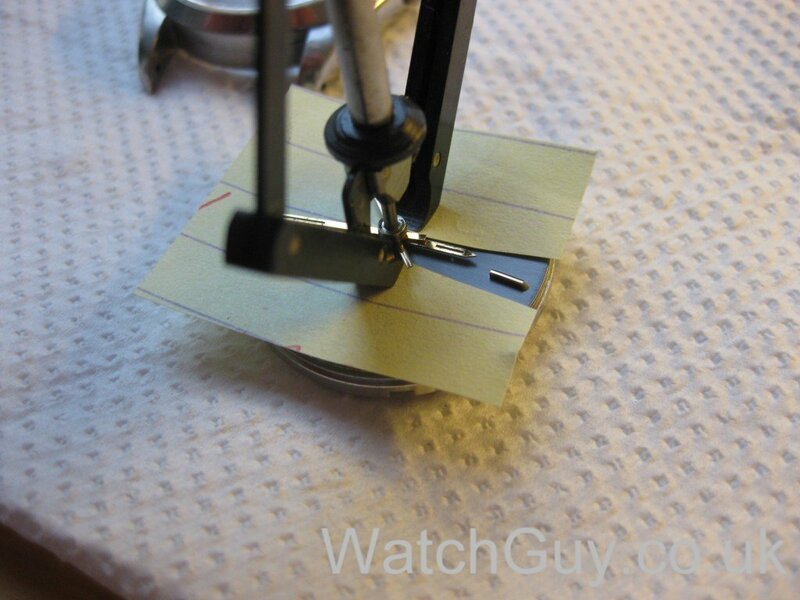 This is a bit dangerous as you can damage the case or bezel. 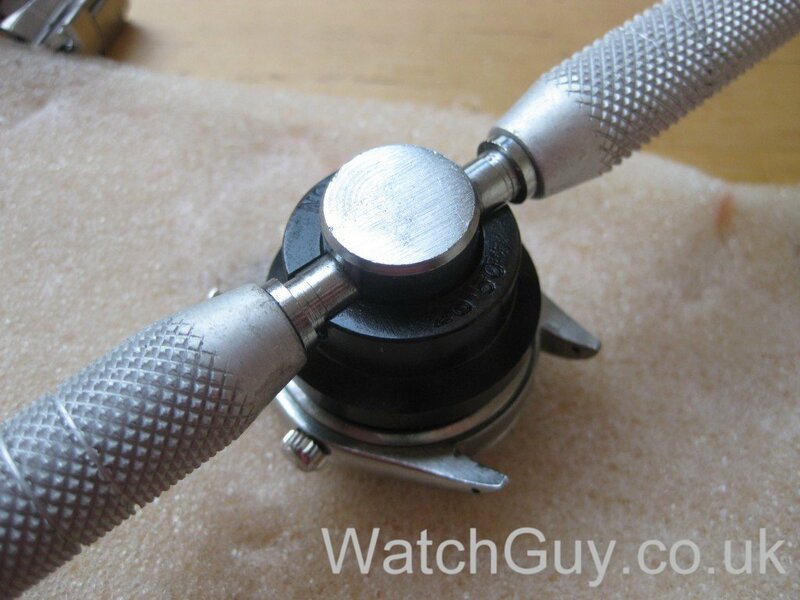 If you want me to remove your bezel, get in contact with me, as I got the proper tool. Hi, i have a Rolex Oysterdate Precision with the # 78350, and i would like to know the date of manufacturing if anyone have information in regard. Hi Christian, not sure if my question will show up given the date of this posting but here I’ll give it a try. 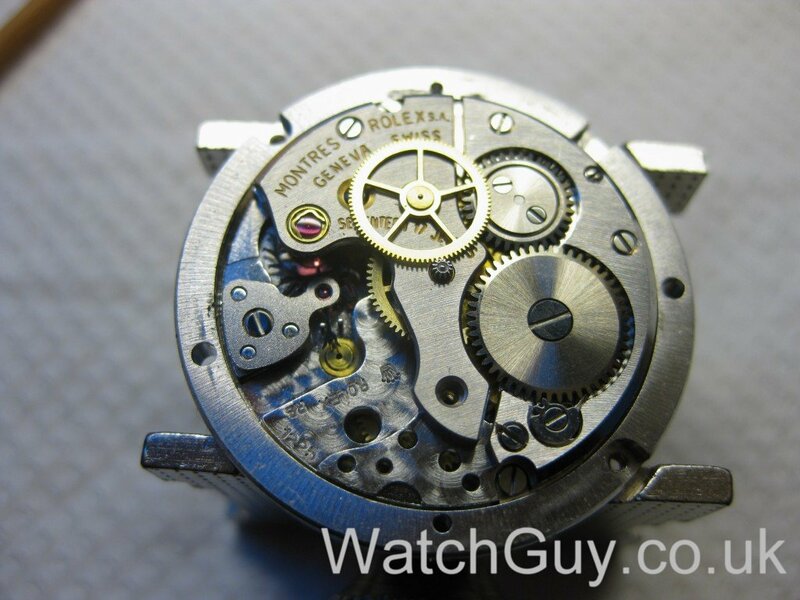 I have a similar Rolex Precision (ref. 6694) bought on eBay as well and never had a problem with it even time wise (minus ten seconds more or less everyday, amazing) and since I’ve bought it it never been cleaned up or oiled. My problem is the crown, the other day while winding it broke. 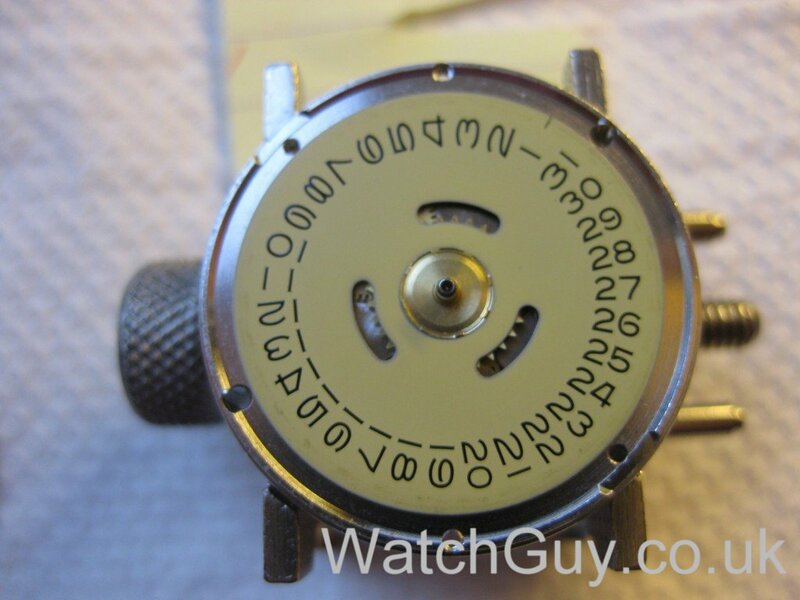 Can you please tell me the crown part number for our ‘precision 6694’ watch? Also all gaskets part number such as back, crown and crystal? My intent is to buy those on eBay and save some money. Also, I have a 6694 ref Sapphire crystal conversion that later on I would have it installed professionally, this crystal came with a white color plastic gasket all around, that would be the gasket itself or is it part of the crystal assembly? Thanks much for the great posting! Have a look at http://cousinsuk.com/ for spare parts. Rolex doesn’t sell parts officially, so it’s not too easy to get hold of anything. Cousins also has pdf files with part numbers. I was comparing my Rolex watch with your information, the only difference is that on my watch does not says ” precision ” , I wonder why? I can see the serial number is 5260413 and the model 6694. Just a different model with the same movement. 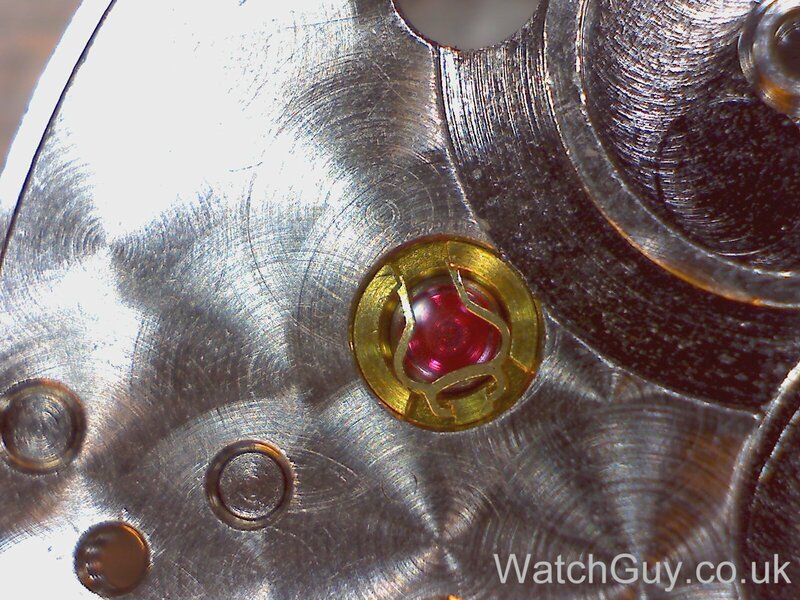 The word “Precision” doesn’t really mean much, as the watch isn’t chronometer certified anyway. Thanks again for this cool blog! 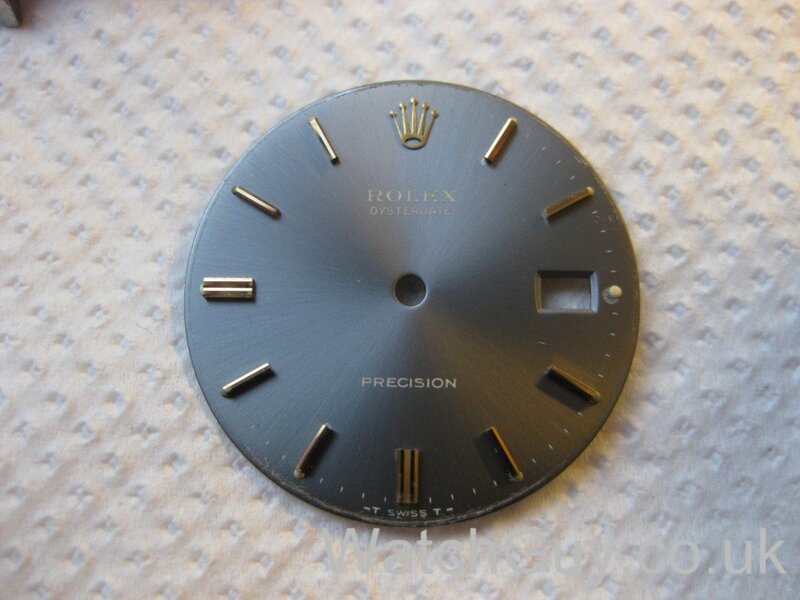 You will need a dial restoration for around £100, and maybe some parts for the date change mechanism. I would say £350 max. I’ll let you know how things progress. Btw great photos! (I’m a pro) and keep up the good work with this informative and very cool blog. What is it about this component that requires it be cleaned by hand? At that time, I was using cleaning fluid with quite a bit of ammonia in it. That dissolves the shellac that holds the pallet jewels in place. The stuff I use now has a smaller ammonia content, and you can put the pallet fork in with the rest. 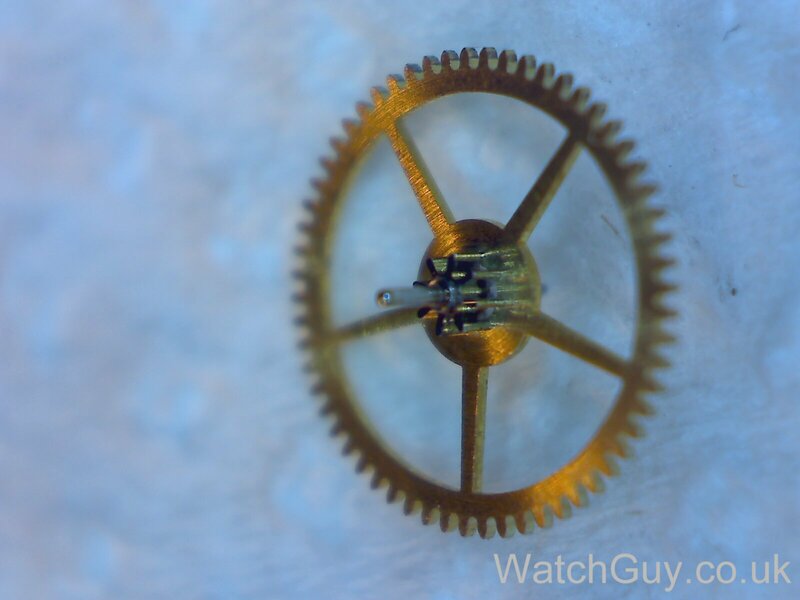 DO you have any clue where I could find a complete balance wheel for a rolex 1210 or 1215 movement. It runs at 18.000. You write well. I lived how you put this together. We should talk. Please email me. The easiest way to open the back is to get a small bouncy toy ball – such as http://www.focalprice.com/YD032X/22cm_Small_Play_Bouncing_Ball_for_Kids.html this one (doesn’t have to have a princess printed on it to work) 🙂 Small is good – this one is a bit on the large size. Mine is about 15cm diameter. Press the ball hard against the back whilst turning it, and presto – the watch back opens. I have a Rolex Oysterdate steel with gold bezel serialnr 1776684.Can you tell me the year it was made? Check on Google – you might be able to find a site that lists the range of your serial number. Hi there, beautiful things and a fascinating read! I just wondered if you could enlighten me as to the dates these were produced between? I have googled, but the information wasn’t forthcoming! From what I read, between 1949 and 1988 – but I can’t say that with authority. Best to google around and see from what date range you can find them. eBay completed auctions might help. I actually had a question for you, does the date on your watch change instantly at 12 am or does it take a few hours? Date change should start around 15 minutes before midnight, ending at midnight with the new date clicking into place. If not, you probably have some dirt in the watch or no lubrication – or both. I’d be more than happy to service that – I’ll send you an e-mail to discuss things. OK…I’ll be looking forward to receiving your e-mail. Thanks. Hmmm – I sent one 10 minutes ago – should be in your inbox by now. Let me know if you got it. Very very nice. Your photos are beautiful as well as instructive. 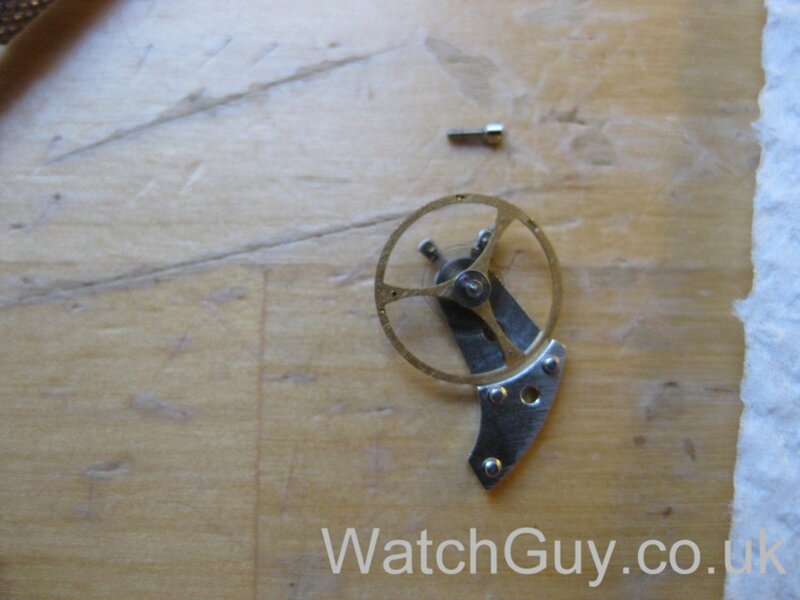 I’m fairly handy at fixing cars and other large machines, but cannot imagine tackling a watch disassembly and assembly. I have an old circa 1941 Rolex Oyster that I recently acquired, and also a 60s solid gold Date. The former definitely needs a servicing, even though it runs very reliably…very reliably ~30 seconds fast every day. I don’t think the back has ever been taken off this watch since 1941. Does this Rolex interest you? I have a drawer full of old watches acquired over the years. Just can’t help myself. If I see one I like I just buy it. I have a Rolex Oysterdate Precision that my dad left me. It looks very similar to the watch you have shown above. I called a local dealer and they want $600.00 to $900.00 to service. How much would it cost me to get a kit to take it apart myself and clean it and where do I get it from. Also would you recomend doing it myself without the training? I don’t plan on ever selling it but I wan’t it to look good. How do I tell how old it is? It has the same style as the watch above, but it has a brown face with gold trim. I can email you a pic. Alternatively, you can ask me for a quote. 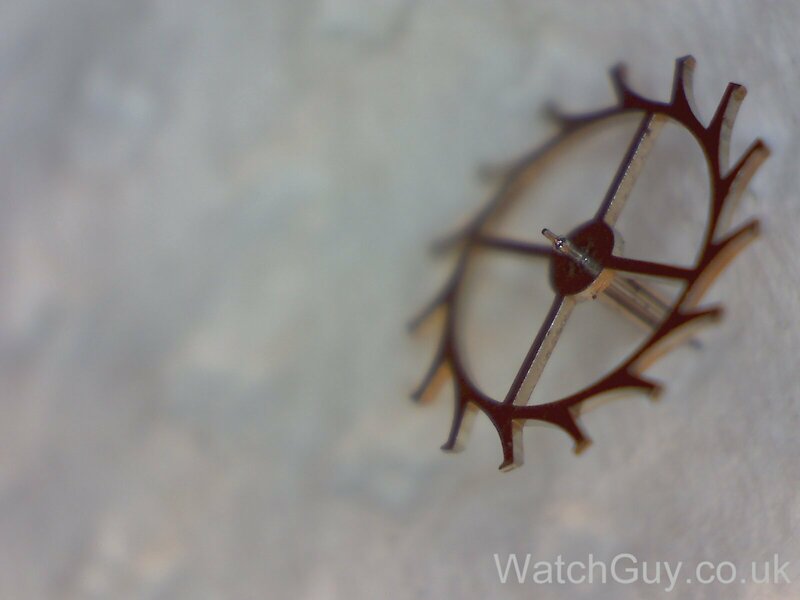 I’d like to see a photo – could you email that to christian@watchguy.co.uk?